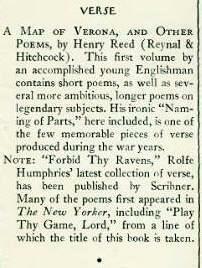 It's always bothered me that Henry Reed's entry in Contemporary Authors lists among his accomplishments: 'Contributor of poetry and criticism to periodicals, including Poetry, New Yorker, Theatre Arts, Nation, Newsweek, and Time.' Articles and reviews which mention Reed, his poetry or translations, do appear in all these publications, but as far as I know, he never authored a poem or piece of criticism for any of the listed periodicals. It's as though some editor lazily flipped through a subject heading card file, or ran a keyword search for his name. Reed comes up several times in the New Yorker, when his adaptations of Ugo Betti were staged on Broadway in 1955 and 1982, and there's a review for his translation of Buzzati's Larger Than Life, in 1968. So I was surprised to find a reference to "Brief notes on works by Henry Reed and Rolfe Humphries" in a bibliography of the writings of Louise Bogan.